Strawberries are in season, the sun is shining, it's out with the winter-warmer puds and in with fruity freshness. I love pavlovas and I love meringue but I wanted to try something new and fun. 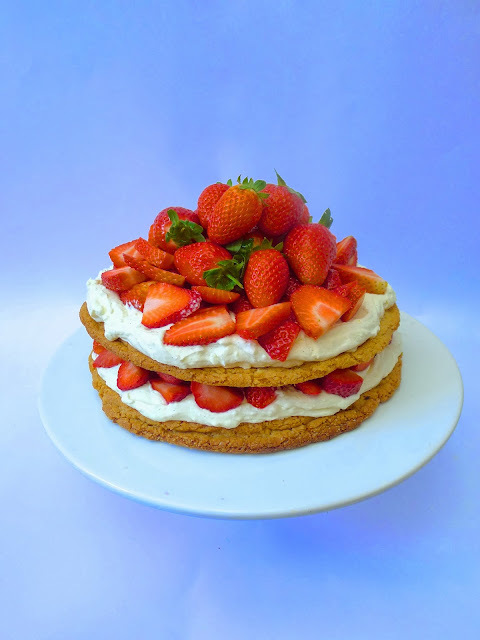 'Cookie cakes' are a massive, new trend in the patisserie world and I came up with a really quick and easy way to make a cookie cake using Sasko Quick Treats Cookie mix, I'm calling it a 'Strawberry shortcake cookie cake'. 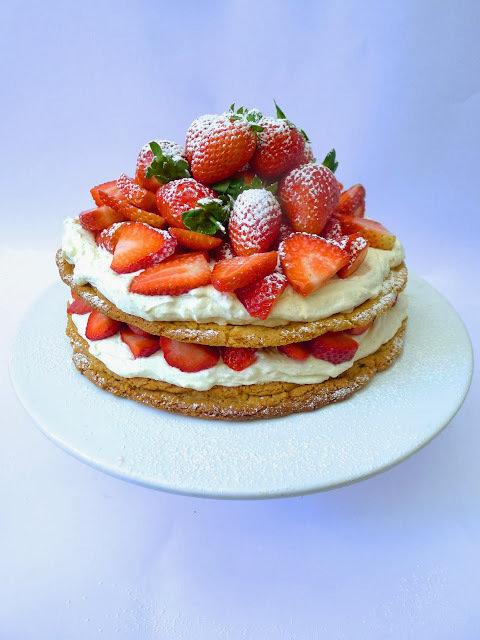 What's great about it is that, unlike a pavlova, you can make it a few hours before eating and even the day before if you like - just store it in an airtight container in the fridge and, if making the day before, brush the strawberries with some melted jam so they don't dry out. Line and grease 2 baking trays. Pour the Sasko Cookie mix into a mixing bowl and rub the butter/margarine into the mix by hand. Whisk the egg before adding to the cookie mix and combine with a wooden spoon – making use of your hands to ensure that all ingredients are combined to form a dough. Divide the dough into 2 equally-sized balls. Using your hands, shape the balls into large biscuit disks that are 15cm wide, with a thickness of 1cm. Carefully transfer them to the separate baking trays, making sure there is space on all sides of the cookie for it to expand as it bakes, and bake for 14-16 minutes until golden brown around the edges. In a large mixing bowl, beat the cream until soft peaks form. Scrape the seeds from a vanilla pod and add to the cream with the sugar and cream cheese. Beat until well combined and stiff peaks form. Wash, pat dry and slice strawberries. Place the first biscuit disk on a cake platter/plate. Spread with half the cream topping and top with half of the cut strawberries. 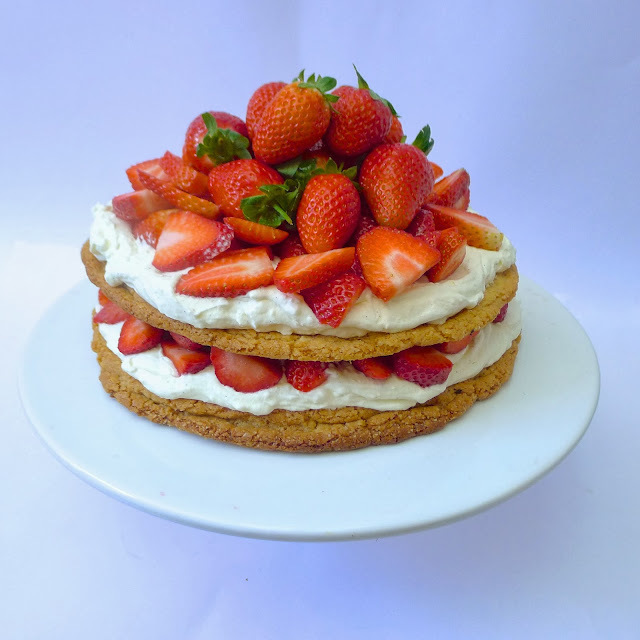 Gently place the second biscuit disk on top of the strawberries and finish with the remaining cream topping and strawberries. Tip 1: If the biscuit disks stick to your work surface as you are shaping them, use a sharp knife to slice under them and lift them off. Tip 2: Be careful not to overwork your dough, overworked dough will result in tough cookies, this is why we suggest rubbing the butter into the cookie mix with your hands rather than using a food processor. Tip 3: It generally takes 10-15 minutes to preheat your oven, never put any baked good into an oven that has not reached the correct temperature, as it will affect the end result.